For a typical warehouse, traffic in aisles isn’t heavy, so the dangers of falling items might be reduced simply by the fact that those aisles host less foot traffic. In a warehouse store, it’s different: aisles are typically far more crowded and host more traffic than an industrial facility does. On a crowded Saturday morning, you can see just how many people roam those aisles — it’s often hundreds at a time. I don’t pretend to know the causes of this accident, but the photos show a potentially double-stacked pallet. Other pallets on the same beam level are double stacked. Some in the photos can seen to be leaning or out of square. Also, the rack is crowded, with a high load density of a pallet in every position. The load itself – gallon jugs of water – is a particularly dense and heavy load which would not lend itself to being stacked too high or in crooked manner. What could be done to potentially reduce the chances of this type of accident? Move heavier, denser loads to lower levels. In this case, it’s clear that this was a beverage aisle, so everything on it is going to be heavy, so that might be difficult. Still, if there is a way to stock items that are heavy lower in the rack system, risks are reduced. Don’t double stack heavy, dense items. People double stack pallets in general warehousing too. The problems are similar, in that heavy items that may be out of square are prone to shift and fall. 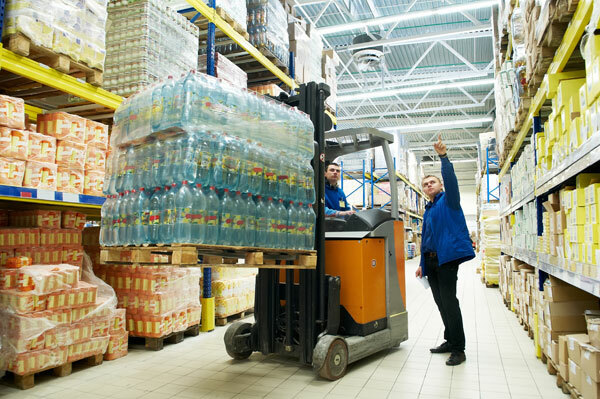 A double stacked pallet of a light, lower density load like potato chips is an entirely different situation than heavy bottles or cans, or other higher density loads. Inspect your pallets both in receiving and in stock. Even a single stacked pallet can break apart and fall if its load is out of square. Storage racks are designed for specific capacities under specific conditions, so a load that shifts its center of mass away from the center of the pallet may be at risk. Loads should be very square, and should not be sagging or leaning. Even if these loads are square and wrapped as they arrive from a distribution center, handling at the store level may jostle or affect them in some way that compromises the pallet. Guard the upper levels. There are ways to reduce risks by installing safety nets, straps or wire barriers that help reduce the chances of a falling pallet. You sometimes see this done at warehouse stores, but not always. Say no to damaged, old, or compromised pallets. Ratty pallets are trouble. They can break, sag or otherwise give way under pressure. When your operation has busy traffic aisles, good pallets equals better safety. Note that these are general guidelines. When dealing with personnel safety issues, always consult with qualified experts.